We started our day at the train station with our fingers crossed that we would be able to purchase a German rail pass for all of our train travel. Technically these passes are meant to be bought outside of Germany and sent to your home or workplace prior to travel. Luckily the man behind the desk let us get a pass at the station. After buying our tickets we checked out of the hotel. This ended up being more of a hassle than we anticipated due to the recent hacking on all of Target’s card purchases. Thanks to this, our card had a hold placed on it where the only way to remove the hold was by calling the bank’s toll-free line. That’s difficult to do when you’re in a foreign country and are charged by the minute. We asked Adam’s dad to call the bank for us but unfortunately he wasn’t able to get very far either because it’s a federal holiday. Once we were checked out of the hotel we journeyed to Residenz and the Englischer Gartens. We just barely touched the gardens, but in the small portion that we did make it to, we saw something that took us by surprise. There were three men surfing in the rapids of a stream. The water was flowing very quickly and the crest of one of the waves of the rapids was probably close to 7 feet. They were treating it like one of the wave rider rides at a public pool. I imagine the water was very chilly as they all were wearing full-body wet suits. We caught a Deutsche Bahn ICE train to Garmisch-Partenkirchen shortly after lunch. The train was incredibly quiet–nothing at all like the squeeky, grindy rails of the trains I’ve been on in the U.S. It took us about a hour and a half to arrive in GaPa. Our hopes were to hike to Partnachklamm after getting checked in at the hotel. We had a lot of trouble getting our bearings in town and locating the correct landmarks. After an hour or so we learned that the Olympic ice center is very different from the Olympic stadium, a key landmark in locating the correct walking trail. We walked some more but eventually turned around when we saw that we were just over halfway there and we weren’t even sure if they would be open on Christmas Day. We ventured to find a restaurant that was open for dinner. Our first stop was at a hofbrauhaus, a traditional German restaurant. All the tables appeared to be reserved, and we couldn’t flag down a waiter/host to check. It looked delicious though so hopefully we’ll get the chance another day to try their food. We continued our adventure through downtown Garmisch. We had seen that a bakery/cafe had been open earlier so that was our backup plan. That too fell through when we learned they had closed at 6:30. Our second backup plan ended up being Chinese at a restaurant that looked promising. Unfortunately, it didn’t meet our expectations but it was warm and filled our bellies. Our legs were very sore and ready for a rest by this time so we spent the rest of the night inside researching future activities, making plans, and watching TV. We woke up early and had a delicious breakfast at the hotel’s breakfast buffet. They had fruit cups, sliced deli meats, sausages, eggs, bacon, sweet pastries, yogurt and muesli, a variety of salads (potato, egg, cheese, etc. ), jams and marmalades, and many different types of breads. Adam met his craving of sausages on a bun and I met my craving of fresh fruit. After breakfast, we got dressed for our day at Zugspitze. 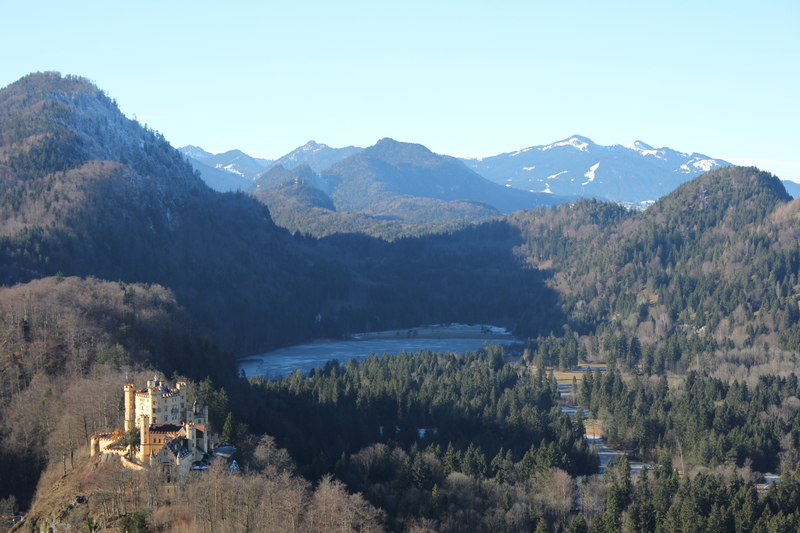 We caught the train from Garmisch-Partenkirchen and took it to Eibsee. From there we transferred to the cable car for our ascent to the mountaintop. It was quite nerve-wrecking to be suspended hundreds of feet above the tree tops and bluffs only to see a wall of mountain in front of you with no sight of the peak. The weather wasn’t necessarily the best for seeing amazing views. We were trapped up in the clouds/fog. There were plaques showing the view that should have been possible, but even these were coated in crystals of frozen fog. There were places where the wind was blowing very strongly and you could hear it howling up the mountain, but other places were very calm. Occasionally the fog would clear enough to see a few peaks away or the glacier below. I really wish the clouds would have cleared even temporarily because standing on top of the Eagle’s Nest during my last trip to Germany was where I fell in love with the mountains and promised that I would one day bring Adam back with me. We took the cable car down to the glacier where we had a quick snack in the cafe. Adam also took the short hike up to a tiny church nearby. I didn’t go along because the snow was very slippery and my shoes were already having some difficulty keeping traction. Had we been a little better dressed for the very chilly and windy weather, we would have rented a sled to use on a few of the slopes. We caught the cog wheel train back to Garmisch-Partenkirchen around 1:30. The descent where the train had to use the cogs was slow. It took nearly an hour to complete the pass through the mountain tunnels. It was snowing at the higher altitudes but raining as we got down lower. The branches of trees above were coated and burdened with the heavy snow. For dinner we went to Alpenhof, a traditional German restaurant in downtown Garmisch. There was a bit of a wait for a table so we strolled along the main streets and did some window shopping. We ended up sharing a table with an older gentleman for the first part of our meal. (It is not uncommon for this to happen in Germany.) I had kase spatzle (a cheesy noodle dish with fried onions) and Adam had kasknuddel (a cheesy dumpling dish). Both came with a side salad. Everything was delicious and very filling. Too bad we don’t have a refrigerator in our hotel room to be able to take back leftovers (although I’m not sure if that’s a “thing” here). We ended the night getting frustrated in our many attempts to call the bank about our debit cards. We eventually found out that all of the room phones were broken. The front desk had a phone we were able to borrow to reactivate the cards.